Wherefore art thou, flickr page? I just deleted the link to my flickr page because the page no longer exists. It seems somewhere along the line, probably due to some wonderful merger I wasn’t paying attention to, my account got deleted. I have no idea where my photographs associated with it went, and I was forced to set up a new account with nothing in it. As I recall, I have paid for this privilege. I’ve asked for help twice to no avail. Thanks for listening to my rant. There were some photographs on flickr that I do not have anywhere else. This constitutes sentimental, not “real” value, of course. I’ll be back soon with a more topical post. Until then, above is the last Monarch Butterfly I saw this year, about two weeks ago. 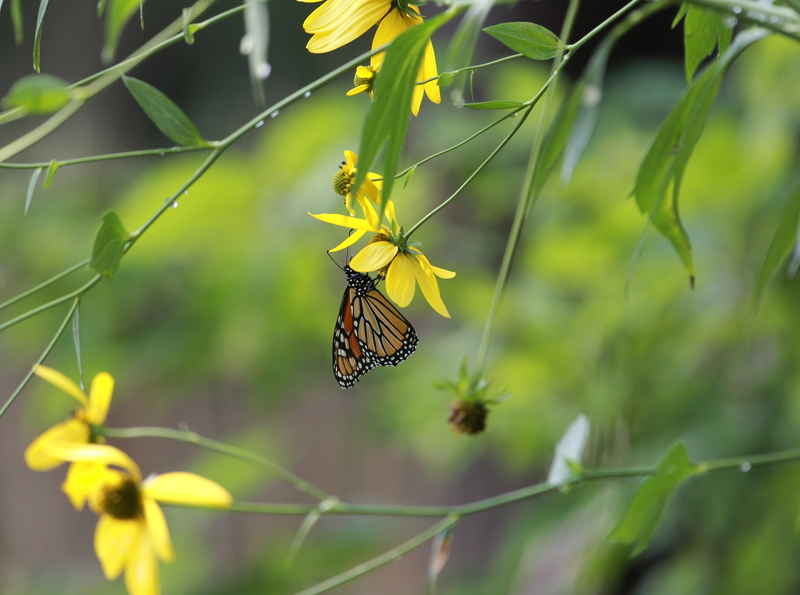 This entry was posted in photography and tagged flickr, Monarch Butterfly by Lisa Rest. Bookmark the permalink. Oh dear. I’m sorry to hear that you have lost some photos. I have heard of this happening before, so I do hope you’re eventually able to get a satisfactory resolution, even if it takes a while. Good luck. Thanks for your concern. Actually what happened is, I found my flickr account but I can only access it from my laptop. I had been trying to access my page to look something up at the work computer and I got a run-around which made me create the new account and I’m a little leery of getting rid of it just in case it wipes out the original one somehow. I keep trying to get a response from their “help” but of course they promise and do not deliver. Such are the complications of digital life. I’ll try to put the flickr link back up soon… ! Kind of like going down the cloud rabbit-hole. Oh good luck! The concept of the ‘cloud rabbit hole’ gives me pause, but it’s a great expression, well-said. You certainly know your Alice in Wonderland, it’s delightful!